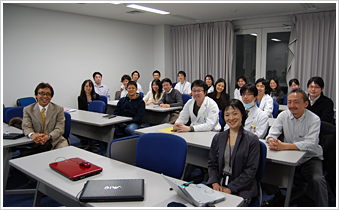 The Department of Ophthalmology at the Keio University School of Medicine casts a wide research net beyond its dual axes of regenerative and anti-aging medicine. Traditionally, our field has been viewed as “disease ophthalmology” (the discipline of diseased eyes), but we additionally incorporate ophthalmological optics, preventive ophthalmology and treatment improving quality of life into our clinical practice. Under this umbrella, we value LASIK’s alleviation of farsightedness, and our far-reaching research interests span topics such as healthy foods for the eye, the science of exercise, the eye’s circadian rhythm, and blue light vis-à-vis ocular health. The educational backgrounds of our affiliated members are by no means limited to medicine. Our team has active members from the departments of agriculture, pharmaceutical sciences, nursing care, and engineering, among others. Do let us know if you would be interested in researching alongside us. We look forward to hearing from you, and to taking on new challenges in medicine together.